This project uses the XSane scanner control software. First, let's get the obvious question out of the way: Why the silly name, or what does the silly name mean? TWAIN is a standard software interface used for communication between software applications and imaging devices such as digital cameras and scanners. The TWAIN project dates from 1992 when several companies from the imaging industry attempted to standardize the communication protocols. Standard protocols are a good thing — hardware and software can be counted on to work together. The name TWAIN isn't an acronym, they just prefer to spell it all upper case. It's a reference to the opening line of Kipling's poem "The Battle of East and West", "Oh, East is East, and West is West, and never the twain shall meet", and the difficulty at the time of connecting imaging hardware and computers. Then a later software project took the name SANE, an acronym for Scanner Access Now Easy. Yes, it's meant to reference the name TWAIN, although it uses a rather different programming model. SANE is just the application programming interface, a collection of tools and software libraries that allow developers to write powerful software, but it isn't really a user application itself. The XSane project has built a nice graphical user interface, based on SANE and originally using the X graphical environment used on pretty much everything that isn't Windows. And if you want to know why "X" is the name of the graphical environment, you'll have to ask the people at MIT who invented X and made it open source and very popular. This background doesn't really matter here, beyond calming any worries about XSane being a bizarre name. If you really want to know the background, go see the web sites for the SANE, XSane, and X projects. If you don't yet have XSane installed on your system, do so now. There are pre-built binaries available for various types of Unix (Linux, BSD, etc) and even Windows. For MacOS X it seems to be available here. See my page on package management to see how to add it to Linux or any other version of Unix. We need to look at the main control window for XSane. This is where you do everything except direct the scanner to make a preview scan and select the area to be scanned. But first, what if you start XSane and it immediately reports an error about no scanning device being available, and then exits? That means that you don't have a scanning device attached! Make sure that your scanner's USB cable is attached, and make sure that the scanner has power. Many scanners, like the HP ScanJet 2200c, have no power button and no power indicator. There's no indication that it has power, just see if XSane finds it. But, the simplest thing is to simply verify that the scanner is powered up and the USB cable is connected. We need to look at the main control window for XSane. We need to go through the functions of many of the controls in this window. File — This leads you to the exit from XSane. Save — You probably want both Overwrite warning and Skip existing filenames selected (have check marks), and a Filename counter length of 3 would be appropriate (click on the number for a menu of choices). Filetype — Increase the JPEG image quality to 95. Enhancement — Make sure that both "Autoenhance gamma" and "Autocorrect colors" are selected (have check marks), and "Preselect scan area" is not selected (does not have a check mark). That's all the settings that are really critical for this project. Click the OK button to get out of the setup. This changes a configuration file stored in your home directory, so you only have to make these changes once. XSane will read those settings the next time you start it. View — Make sure that Show tooltips is selected. If not, click on it, then bring the View menu back up to make sure it has a check mark. If you care about the units displayed at the bottom of the main window, metric versus imperial, choose that under Length unit. Windows — If any of the other windows go missing, it's because they are de-selected here! The only other window you really need is the preview window. It's the other window with the big XSane logo in it right now. If it isn't on your screen, make sure it's selected. We just made sure that "tool tips" were turned on. If you hover the mouse over an item (move the pointer so it points to the item, then don't click but leave the mouse motionless), a reminder will appear. Number of pages to scan (currently "1" on my example) — This should be set to 1. Target (next to the bulls-eye pattern) — This should be set to Save. Now you can easily create a folder for each patient, sort the images into those folders, and burn one CD for each patient. Or, with K3b, simply select files off the desktop based on their name and create the CDs without making folders. The next time you start XSane, you will find that it is ready to save the image to a file named smith-006.jpg. It is very important that you verify the file name every time you start XSane, and every time you move to films for a new patient. Value that is added to file counter after scan (currently +1 on my example) — This should be +1. It's the number added to the end of the file name after each scan. It is very important that you leave some dash-three-digits extension to the file name when you make changes. In other words, change it from jones-004.jpg to smith-004.jpg and not to smith.jpg! 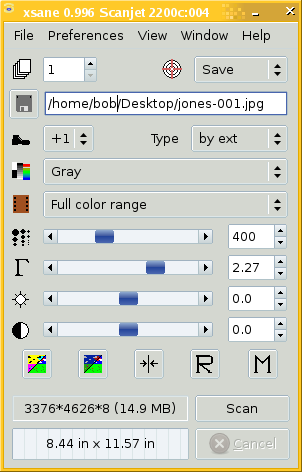 Type of image format — This should be by ext, and so it is very important that the file name always end .jpg or .jpeg. Selects the scan mode — This should be Gray. Select source medium type — This should be Full color range. As for that source medium, you may notice that there are choices for slides and for a variety of negatives. I have read that those are pre-defined adjustments to the brightness and color sensitivity curves, and you can create your own and add it to the choices by specifying the correction curves in a personal configuration file. I could have solved the problem of adjusting the scanner sensitivity for backlit X-ray films that way, but I found a way of accomplishing this that is easier for me to describe and for you to do. 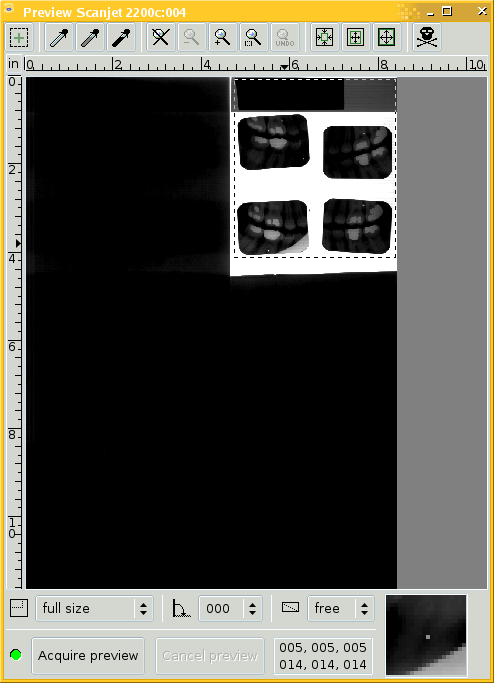 Set scan resolution (dots of different sizes) — This should be 400 for the intraoral 40x30 mm films, and 200 for the panoramic 280x125 mm films. Set gamma value (Greek letter Γ) — Gamma correction is a very important remapping of brightness values. The gamma value of 2.27 you see in my example seems rather high, but when we get to finally scanning some films we will see why. It's usually spelled "gamma" but sometimes you see the Greek letter Γ as here, or the lower-case γ. See the excellent Wikipedia description for details on what gamma correction is and why it is so important. Set brightness (looks like a sun burst) — This will be set to 0.0 by one of the steps in our scanning procedure. Set contrast (half-white half-black circle) — This will be set to 0.0 by one of the steps in our scanning procedure. Negative (left-most of five square buttons) — You do not want to select this. Try clicking on it, you will see the effect in the preview window, and you will notice that the button is darkened, to look as if it is pushed in. Click it again to turn it off. Autoadjust gamma, brightness, and contrast (second of five square buttons) — This button will be very important in our scanning procedure! 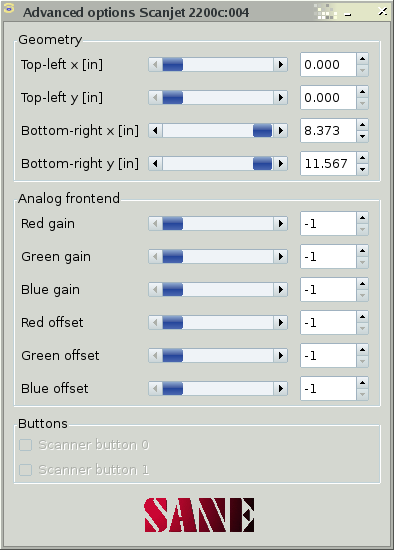 Set default enhancement values (third of five square buttons) — This resets gamma, contrast, and brightness to 0.0. Restore enhancement values (fourth button, with "R") — You don't want to use this! We must set the enhancement values manually for each set of films. Store active enhancement values (fifth button, with "M") — You don't want to use this! We must set the enhancement values manually for each set of films. Scan — After you have done a preview scan, and selected the scan area, and adjusted the gamma, all as described on the next page, you will click the button to run the scan. Cancel — This button is currently greyed out, it only becomes active during a scan. You would use this to cancel a scan you didn't want to perform instead of waiting for it to finish on its own. There would be no harm in letting it go ahead and do that scan, you would just have an irrelevant image and a little wasted time. Below is the other important window, the preview window, as it appears when you first start XSane. 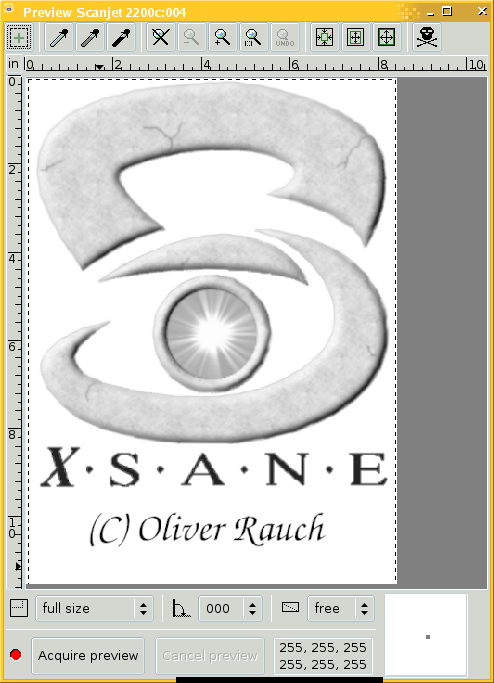 We have already set it to greyscale mode, so you see the XSane logo without the colors. So, I'll set up the scan. I'll place a 4-film sleeve on the glass and then block off the rest of the glass with opaque material. Next, I'll click the Acqure preview button. The Cancel preview button would be active during the preview, I could use it to quickly end a preview I realized wasn't going to work. The preview window when you have just started XSane in greyscale mode. A preview scan of one 4-film sleeve. Here is the result of that preview scan. A little light has leaked under some of the opaque blocking material, but not very much. See those dotted white lines? They define the area that will be scanned. We want full control over that, so we de-selected automatic adjustment of the scanning area in an earlier step. Right now XSane is ready to scan the entire area, although most of it is blocked off. Click and drag the dotted boundaries, by their sides or corners. Limit the scan area to just what you need to capture. Remember that we are scanning at 400 ppi, and so a 4-film sleeve about 9.5 by 11 centimeters in size, or about 3.75 by 4.4 inches, will result in an image with dimensions of 1500 by 1760 pixels, far larger than what fits on a typical display! That's fine. We want to capture good data. Whoever receives the images can decide what they want to do with them. At the same time, don't crop out areas that you want! We are making an archival copy, presumably this is our last chance to capture the data. You may have noticed that I selected the paper or plastic tab at the top of the sleeve. This is a real patient's sleeve and I have covered all the written information with completely opaque electrical tape. However, for most of the sleeves I have experimented with, the written information can be captured in these scans! That is good news for helping to organize the images, and letting you double-check one last time that you are giving patient Jones the scans for patient Jones, and not those of patient Smith! The preview scan has been cropped. The advanced options — leave these alone. You may see extra features in the Advanced options window. See the Analog front end settings available in the example above. Will you see these? It depends on the type of flatbed scanner you use. If they are supported by that scanner, as they are by the HP ScanJet 2200c, they will appear. However, I found that these aren't really helpful. Yes, you can adjust the gain and DC offset of the three color channel amplifiers here. But those amplifiers get very noisy with higher gain. Leave those at -1 or 0 or whatever their default settings are. We will handle the brightness issue with gamma correction. Just ignore this panel if you see it! Now you're finally ready to Put it all together and scan some films!